Getinge’s growth is continuing at a high pace – net sales for the quarter increased by close to 15%, almost half of which was organic growth. The order intake increased by slightly more than 8%, of which just under 1% was organic.This was in line with expectations due to a strong third quarter in 2017. Market and product mix effects in the form of robust growth in capital goods and in emerging markets are continuing to have an adverse effect on the gross margin. As stated earlier, these effects were foreseen and are natural in a phase of growth, and they are expected to support future sales of consumables linked to the use of our capital goods. In addition, the gross margin was negatively impacted by Getinge actively securing a number of large business opportunities in emerging markets at lower margins. Cash flow improved significantly, as a result of more efficient management of our working capital. The operating profit for the quarter was strongly negatively affected by a provision of SEK 1.8 billion, intended to cover future costs for claims related to hernia mesh products in North America, which we communicated on October 14. On October 18, 2018, an agreement to divest the surgical mesh business was signed. The biosurgery business has been a relatively small segment within Getinge’s overall portfolio and the only therapeutic asset in the general surgery field. The divestment is a strategic desicion in order to focus on core therapeutic solutions. The deal is expected to close in the fourth quarter of this year subject to receipt of customary regulatory approvals and satisfaction of other customary closing conditions. Order intake rose organically by 0.9% and net sales increased organically by 7.2% primarily due to the continued favorable trend in capital goods and in emerging markets. Adjusted EBITA amounted to SEK 438 M (544), negatively affected by a lower gross margin due to the product and market mix. Currency effects had an impact of SEK +383 M on net sales, SEK +129 M on gross profit and SEK -24 M on EBITA. Adjusted earnings per share amounted to SEK 0.78 (1.20). A provision of SEK 1.8 B was made to cover costs related to lawsuits in North America related to surgical mesh implants. The provision is recognized as items affecting comparability in operating profit. 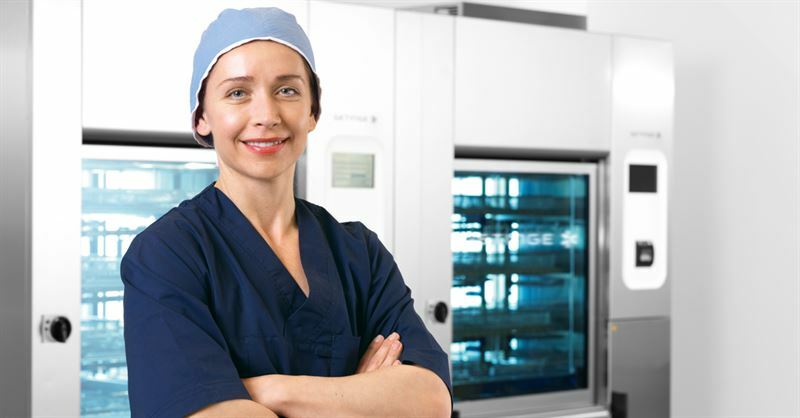 The TSO3 distribution agreement for low temperature sterilization ended, resulting in an item affecting comparability of SEK -126 M in operating profit. Cash flow after net investments amounted to SEK 801 M (182). A conference call will be held on October 18 at 3:00 – 4:00 p.m. CEST hosted by Mattias Perjos, President & CEO, and Lars Sandström, CFO. Please find dial in details to join the conference call here. This information is such that Getinge AB is obliged to make public pursuant to the EU Market Abuse Regulation and the Swedish Securities Market Act. The information was submitted for publication, through the agency of the contact person set out above, on October 18, 2018, at 13:00 CEST.